New Year Jumbo Prayer Candle AND Tarot Reading for 2019! 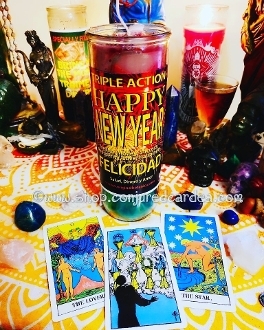 Our Products >> 1 New Year Jumbo Prayer Candle AND Tarot Reading for 2019! 1 New Year Jumbo Prayer Candle AND Tarot Reading for 2019! Extra large prayer candle filled with good fortune scrolls, pyrite, lucky keys, evil eyes, pyrite, essential oils, black eyed peas for good luck in the new year, bits of cash, a safety pin to pin down your goals and so much more! This candle ways over TWO pounds! PLUS!!!!!!!!!!!!!!!!!! A three, card, NEW YEAR themed tarot reading designed to reveal what your New Year message is! This reading will reveal what your focus should be for 2019 and allow you to prepare and get proactive to claim your new year! Begin burning on New Year's Eve with your petition placed underneath for what you'd like to achieve in the new year. Be realistic but direct and keep it positive! No negative wording! Instead of saying " I wish I wasn't so poor" try "I am financially prosperous and secure". Instead of saying "I don't have anyone and am alone" try "I am surrounded by healthy, reciprocated love". Burn some everyday until the candle is gone.